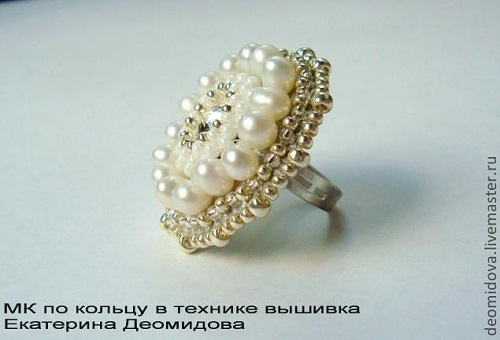 We do not often see bead embroidery as a technique for rings. But this statement bead embroidered ring tutorial by Catherine Deomidova manages to feature a Swarovoski rivoli. The bead embroidery technique is not unusual but I noticed she had a clever way of adding the leather backing. This tip shows how you can hid the main part of the ring blank. Note that she uses an adjustable ring which can be opened up and the leather part inserted. As you know, the pointed back of a rivoli probably meant she added a hefty amount of thick glue at the beginning to keep it upright!